At one point or another, every human being will face obstacles and challenges in their lives, and usually in those moments, life ceases to make sense, or so it seems at least. It may present as a loss of a loved one, the loss of a marriage or long term relationship, career or other personal challenges, inability to conceive, a failed business and the list goes on and on. We therefore grapple for answers wondering how we got to where we are when confronted with real life issues that take us by surprise or challenge our trouble shooting skills. While some problems last decades, some last only a short time, but irrespective of the duration of these unwelcome phases of life, as humans, we experience various emotions and react to our circumstances in different ways. And while bad experiences and challenges are common to all of us, what’s different however is how each one of us reacts to them, which in turn will determine whether or not we pull through or not, or if we become better people as a result. I guess the question for some people is why a good God would allow suffering and pain in the first instance. This is a question that so many have been trying to answer for decades. From Atheists, Religious Groups, Authors, non-believers, to Christians and people of faith. The concept of pain and suffering is a complex one, and one that we are still trying to grasp. 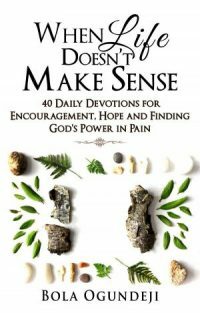 Theologians and philosophers have tussled for centuries with the mystery of undeserved pain, and no one has ever come up with a simple and comprehensive solution. Nevertheless, what we cannot deny is the existence of evil, pain and suffering in our world. Otherwise why would a 4-year old girl be snatched from her parents and never to be seen again? What do you say to a teenager who has just lost both parents in a car crash? How do you comfort a mother who has just lost her only child? What happens when a business owner suddenly loses all that he’s built for the last forty years in a sudden economic meltdown? How do you explain a husband or wife’s indiscretion to their spouse or children? What do you tell a child when his/her parents are going through a painful and messy divorce? How do you deal with the pain of rejection and abandonment by a loved one? What do you say to the Syrian refugees whose homes and lives have been shattered by endless war, or the Coptic Christians recently killed earlier this year in Egypt? The list goes on and on and in fact the Bible confirms the existence of suffering and pain. Jesus said in John 16:33, that we will face tribulation and provided no exemption from this. “These things I have spoken to you, that in me you may have peace. In the world you will have tribulation; but be of good cheer, I have overcome the world.” – John 16:33. While the above is a fact, however the truth is that our saviour, Jesus, who is all loving and powerful provides an assurance and commands us to be of good cheer. Since He overcame the world, we also are able to overcome our pain, suffering and whatever it is life throws at us. What more assurance can we possibly need beyond this? Unconsciously, and without meaning to, I’ve found from my own experience that at times of great stress, it’s easier to believe in the assurance of a friend, family member or labour market trends much more than it is to believe in the one who is sovereign over ALL. But looking carefully I find the track record of Jesus and His accomplishment on the cross compelling and comforting. You will find that He is Lord over all situations and problems, and there is no need He cannot meet. Does that mean every problem gets solved as expected? Not in all cases – though this has nothing to do with God’s ability, but more to do with other factors that we may not be aware of at the time. Nevertheless, “hope and love are the greatest stabilizing forces that we can know in the face of suffering and uncertainty,” says Nicky Gumbel. These two things are already provided in who Jesus is and what He does for us daily. All we have to do is ask and believe that He already made them available before we dared to ask. The good news is that He wants to walk us through our challenging times and if He doesn’t make them disappear, He will bring us through them safely by His grace, wisdom and love, and by the love and support of others.